Sister Elizabeth Newman sent Rotarian Peter Bird the picture of a young boy and girl who are now able to live more normal lives thanks to the orthopaedic materials the Club sends to Ghana. 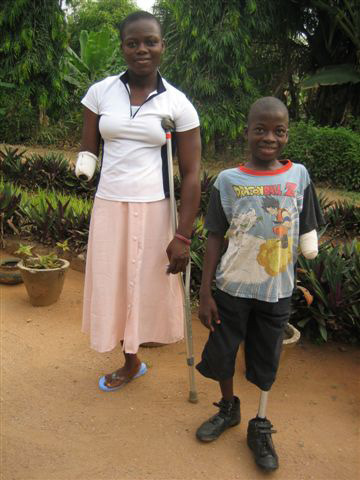 The boy lost his limbs at the age of only one week and the girl due to neglect after a fall from a tree. She was treated by a native doctor and only after becoming extremely weak was she taken to hospital. There they had to amputate her arm and her leg through the hip, in order to save her life. Sister Elizabeth says that all the limbs we send are good for their puposes. The hands and arms are very much appreciated since the clinic is getting an increasing demand for them. Industrial accidents as well as road accidents are taking many arms and hands. These are very costly to buy when ordered from Germany, so the limbs supplied by the club help to reduce the costs considerably. They can modify limbs in their own workshop to fit the patient better. Now they only need to order an African skin colour glove that goes over the hand, but thes alone cost 90 Euros each. The rotary Club of Heswall has been engaged in this activity for many years and it is gratifying to see a much needed end use for limbs which are no longer needed in this country.